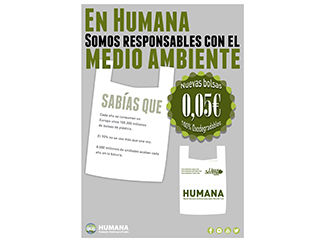 Since July, 14, the Foundation offers its customers reusable bags which aims to encourage reuse and reduce the impact on the environment of existing plastic bags. The new bags will cost to the customer of 5 cents. 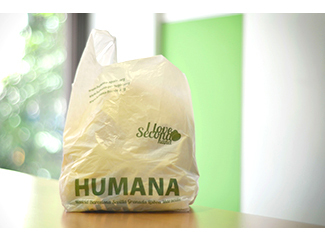 The 'oxodegradables' bags are made of plastic, which has been added a substance based on polyolefins, called d2w. This substance allows control and shorten the life of the bag. Once discarded, the plastic begins its degradation in the presence of oxygen by an oxidative process which is accelerated by light and heat, mainly. The biodegradation process is completed by the action of various microorganisms. This process does not generate any harmful residue. Products with d2w harmlessly self-destruct after having served their purpose. Disappear faster than natural products such as sheets and much faster than conventional plastic. This does not prevent them from being equally reusable and recyclable. Each year consumed in Europe about 100,000 million plastic bags. 90% is used only once. 8,000 million annually end up in the trash. These figures give an idea of ? ?the impact on the environment and consumption of resources caused by their manufacture. The key is to promote the 3Rs: reduce bag consumption, encourage reuse and recycling favor after the end of its life cycle.